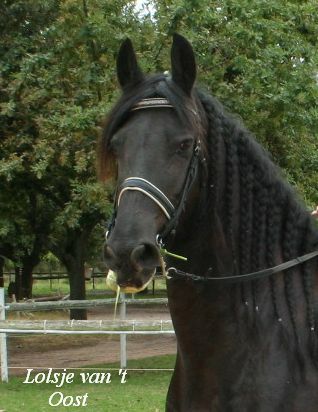 The most striking features of the Friesian horse are the uniformity in body structure, the proud positioning of the head and neck, the stepping paces, and of course the beautiful colour and the long full tails, manes and fetlocks. Pierre and Nella Veldhoen came from the Netherlands and set up their stables - Stal 't Vuurbaken - in South Africa, bringing their passion for Friesian horses with them. Nella's passion for horses started in the Fifties, when she climbed on a horse's back for the very first time. The bug had bitten her and it didn't take long for Pierre to follow suit. Both are passionate about their Friesian horses and are very involved in the breeding and sport related to this breed of horse.